This recent private dinner at Scalini Fedeli hosted for a small group of wine lovers provided a fabulous opportunity to delve into the wines of four reference point Barolo estates and enjoy the cuisine of one of New York City’s most highly regarded Italian restaurants. Located in New York City’s Tribeca, Scalini Fedeli has a distinctive Old World feel that sets it apart from many of its peers. Executive Chef Michael Cetrulo presents an Italian-inspired menu with a few twists. The penne with Italian sausage and wild mushrooms in a tomato basil sauce and seared and roasted pork chop with vodka-mascarpone sauce and truffle butter potato purée were two of the highlights on this night, although most of the focus was on the wines. And what wines they were. 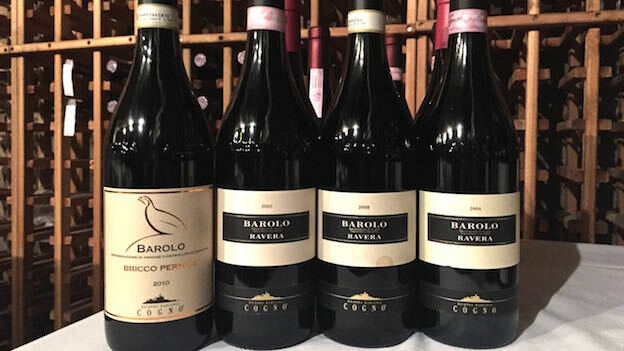 For this tasting, I chose four producers whose Barolos encompass a wide range of styles. The flights were a combination of younger wines that are still possible to source with a few older vintages sprinkled in for added perspective on how Barolos develop over time. It’s hard to know where to start with a tasting such as this one because the producers, wines and vintages essentially represent a string of top hits over the last two decades or so. With the exception of a less than stellar bottle or two, the wines were fabulous. Moreover, it was a great deal of fun to spend a few hours with this collection of fine Barolos and a group of people who deeply appreciate them. A flight of Barolos from Elvio Cogno kicks off the evening. I have been following this small estate in the Ravera district for some time. The wines have never been better than they are today. Family patriarch Elvio Cogno passed away earlier this year, but the wines have really been the work of Walter Fissore and his wife, Nadia Cogno, for as long as I can remember. The 2010 Barolo Bricco Pernice makes for a luxurious start to the evening’s proceedings. Just as striking in its aromatics and precise as it has always been, the 2010 is utterly magnificent. The flavors are bright and finely sculpted in a Barolo that captures the pure pedigree of this great vintage. The 2008 Barolo Ravera seems to be putting on weight in bottle. Dark, pliant and powerful, the 2008 is also going through a period of dormancy, so it is best left alone for at least a few more years. Cogno’s 2005 Barolo Ravera is impressive. Complex and deep, the 2005 hits all the right notes, with expressive tobacco, spice and leather nuances that wrap around a core of intense, vibrant fruit. This is a strong showing in a vintage that continues to surprise. The 2004 Barolo Ravera comes across as a bit burly in this setting, with more of an earthy character than I recall seeing previously. I suspect this is not a perfect bottle. These wines from Luciano Sandrone are simply brilliant. No other producer has bridged traditional and modern styles as successfully as Sandrone, so it is hardly a surprise that his wines have found such a wide audience over the years. The 2008 Barolo Le Vigne is just as magnificent as I remember it. Sweet, perfumed and lifted, with notable brightness in its red cherry and pomegranate fruit, the 2008 exudes the class of the vintage in spades. In a word: fabulous. 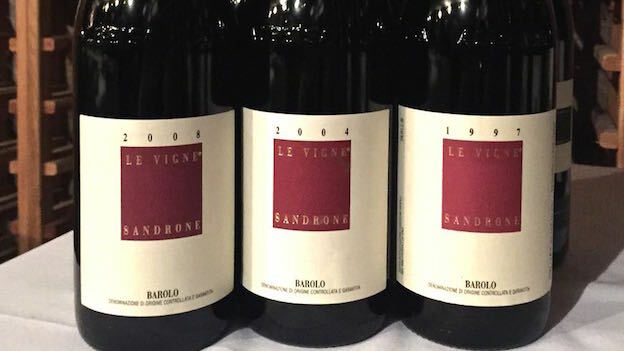 Sandrone’s 2004 Barolo Le Vigne is equally compelling. A bit deeper than the 2008, the 2004 (also from a long growing season) has developed every bit as well as I had hoped it would when I first tasted the separate components from barrel many years ago. The 1997 Barolo Le Vigne is another wine that faithfully expresses the personality of the vintage. Rich, dense and beautifully layered in the glass, the 1997 is a luscious, deep Barolo with considerable appeal. My only quibble is that the French oak is a bit too dominant. The 1997 Le Vigne is edged by the 1997 Barolo Cannubi Boschis that follows. Ample and incredibly inviting, the 1997 Cannubi Boschis is a wine of total sensuality. An exotic mélange of dark cherry, plum, leather and spice melds into the super-expressive finish. All of a sudden the conversation stops at the dinner table. That is what great wines can do. The quartet of wines from Vietti is spot-on. The four vintages provide plenty of insights into the house style favored by Alfredo Currado and that adopted by his son, Luca, in more recent years. 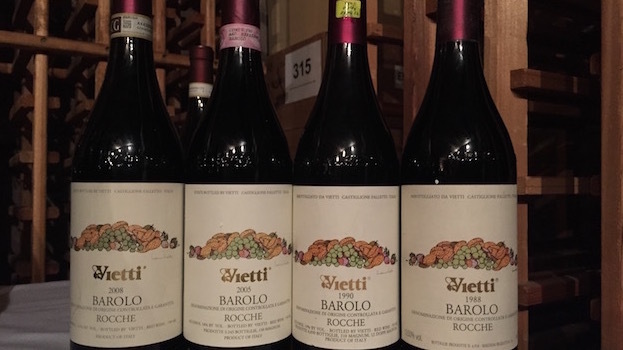 Vietti’s 2008 Barolo Rocche is once again stellar. What a wine. Intensely aromatic and racy, with beautifully layered fruit, the 2008 is a superb example of this great Barolo vintage. Sweet red cherry, plum, hard candy and spices give the 2008 much of its perfumed, silky personality. Tasted next to the 2008, the 2005 Barolo Rocche comes across as a bit burly, especially in its tannins, but it also shows terrific balance for the year. The 2005 Rocche has always had a masculine edge to it. That is very much the case today as well. These last two wines from Vietti are now fading and need to be drunk. The 1990 Barolo Rocche is a decidedly old-school wine. Now fully mature, or close to it, the 1990 presents a host of worn-in leather, tobacco and menthol nuances. I don’t see much upside in holding bottles too much further. Similarly, the 1988 Barolo Rocche is resolved. Although the 1988 might hang on for a few more years, the flavor profile is tertiary and the fruit is fading. This flight from Bartolo Mascarello is absolutely stellar. There’s not too much to say, except that the work Maria Teresa Mascarello has done here over the last ten years or so is both truly remarkable and evident. The 2008 Barolo is a wine I bought on release, and then bought again several times, as it has continued to improved over time. Silky on the palate and intensely perfumed, the 2008 is all grace. Hard candy, rose petals and sweet spices are some of the notes that take shape in a Barolo of total sensory overload. Mascarello’s 2007 Barolo shows just how compelling this vintage can be, even now. Sensual, layered and totally voluptuous in the glass, the 2007 shows the more flamboyant side of Barolo. I find the wine’s voluptuous, engaging personality impossible to resist. Sure, 2007 is not a classic vintage, but when a wine is this good, I say: Who cares? 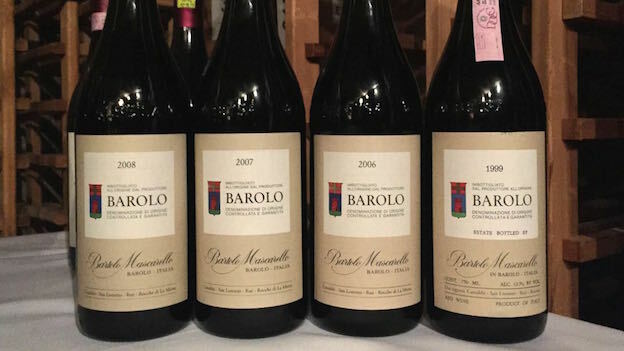 The 2006 Barolo is one of my all time favorite Bartolo Mascarello wines. It won’t be ready to drink anytime soon. Beams of tannin give the 2006 its imposing, vertical personality. The 2006 is a Barolo for classically-leaning palates and readers who have the time to be patient. Even so, the 2006 is a utterly majestic tonight. Mascarello’s 1999 Barolo is sinewy, powerful and intense, with bright, salivating acidity and tons of persistence. Hints of leather, smoke, tobacco and licorice open up gradually, but the 1999 remains tightly wound and in need of further cellaring or considerable aeration to offer its best drinking. I have seen some bottle variation of late, but the 1999 remains one of the better vintages of the 1990s here. Looking back at the evening, the Sandrone and Bartolo Mascarello flights were the most consistently brilliant. Of course, much of that has to do with the condition of the individual bottles, and there is always some variability with older wines. Even so, this was a great opportunity to revisit a number of classics.